Beverage cartons have already been on the market for over 100 years. The milk carton, originally entirely made of paperboard and thus 100 percent bio-based, was patented in 1915. A century later, beverage cartons are the most widely used packaging for fresh liquid fluids such as milk, yoghurt and other dairy produce. 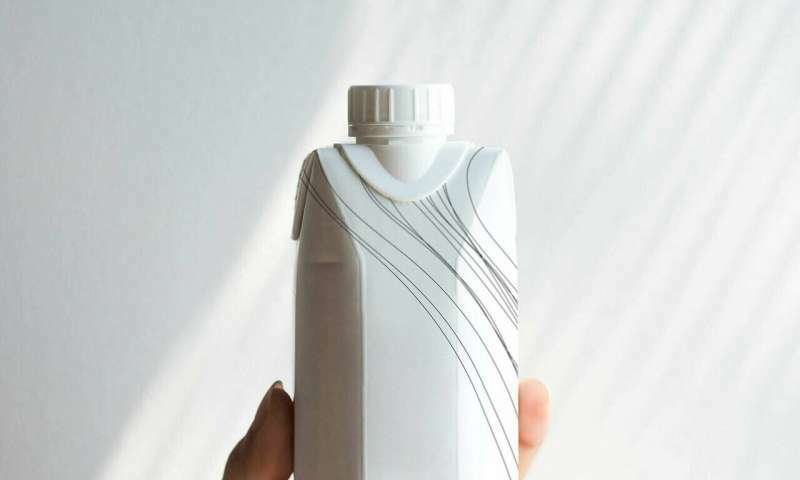 Beverage cartons for long-life liquid products, also called 'aseptic products', like (sterilised) dairy products, soy milk, juices, fruit-based lemonades and non-carbonated waters, additionally have a foil laminate, a thin aluminium layer that protect beverages from light and oxygen. The aluminium layer is just 6.5 micrometres thick, less than a quarter of a hair. Aluminium is an excellent barrier for oxygen and light and thanks to this these drinks can last for up to 18 months without preservatives or refrigeration. The plastic polyethylene it is usually derived from fossil resources. A steadily increasing volume of PE is made from biomass (residues like e.g. sugarcane from Brazil or tall oil from Nordic forests). The renewable PE is finding increasing application in beverage cartons, initially for the PE cap and later also for the PE coating. Examples include the Tetra Rex and the Pure-Pak bio-based milk cartons. SIG's aseptic Signature Pack contains a special polyamide (PA) polymer barrier as a replacement for aluminium. To reduce the environmental impact, single use packaging should ideally be recycled. For beverage cartons it has always been a big problem that, although technically recyclable, there weren't many places that could actually recycle them. Because they consist of multiple layers, it is difficult to separate and recycle the different materials. That situation has gradually improved with an increasing number of specialised recycling plants (some 25 across Europe) and a steadily growing recycling rate. Belgium and Germany where early to introduce beverage carton recycling and show official recycling rates of 89 percent and 75 percent respectively. The Netherlands introduced beverage carton recycling only in 2015. For the whole of Europe the material recycling rate of beverage cartons has increased from just over 5 percent in 1993 to more than 47 percent in 2016. The rest of the cartons are either incinerated or landfilled. As a result of the recent ratification of the EU's Circular Economy Packaging (CEP), the official recycling rate of paper and cardboard packaging has to increase to 85 percent in 2030. Environmental NGOs (like DHU in Germany) critically review the official recycling data. Deducting beverage cartons not collected or sorted properly, contaminating materials and the plastic components (which are burned, rather than recycled) they calculated for Germany for 2012 a "real" material recycling rate of 36.5 percent, versus the official rate of 71 percent.